With a whopping 20 starters to entice you — both vegetarian and non-vegetarian, Buff Buffet Buff is perfect for all you foodies out there. Serving only in the buffet format, they start with breakfast for just INR 297. Buff Buffet Buff only does buffets as the name suggests. But they do it with a twist. They specialise in appetisers, so be ready to load up on 20 kinds of them, brought straight to your table. With options like chilli butter garlic prawns, smoked fish, chicken skewer, drumstick Manchow, crispy chilli potatoes, malai kalimirich mushroom and dim sum it is easy to get lost in a food trance. But hold on, their mains are good too! From the usual suspects like mutton biryani, fried rice, pulao and curd rice, they also have saagwala meat, chicken roghini, kung pao chicken, Cantonese prawns, grilled fish with lemon to be had with assorted breads, dal makhni, kofta and paneer! They also have a wide variety of live counters for parathas, dosas, egg dishes and a live Mongolian barbecue. Well, there is more! They have 16 types of desserts including cheesecakes, assorted pastries and exquisite Indian desserts. Their desserts are a blend of Indian and continental with options like semiya payassam, phirni, jalebi, Horlicks barfi, Mango cheesecake, choco mud cake and a live ice-cream counter where you can make your own ice cream by choosing from different flavors and toppings. The highlight of their desserts is their chocolate pani puri! 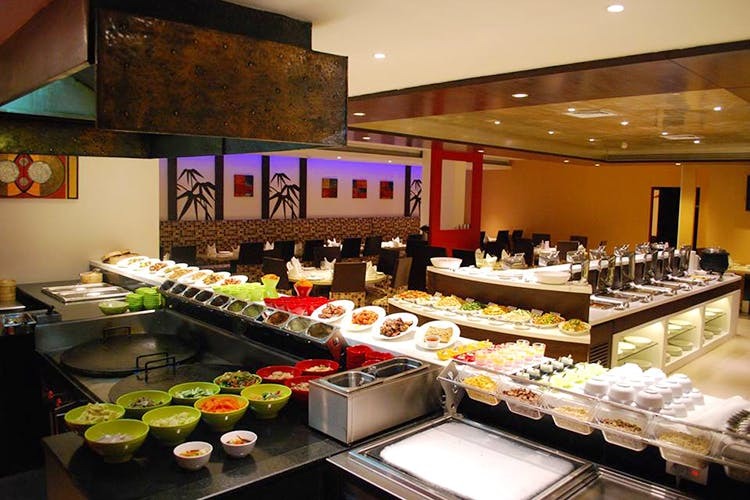 They have breakfast buffets, lunch and dinner buffets and Sunday Maha Brunch Buffet so you can take your pick! Definitely go here for their variety of food options, we know we will! Make sure you have an empty stomach before you go here if you want to try everything and do justice to the food.